Hi, I’m interested in Portable Single Pole Telescopic Clothes Rack Clothes Dryer Shoe Rack Wheels. Please contact me. Thanks! 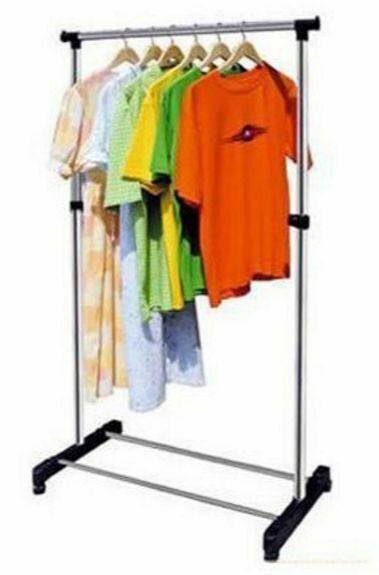 Keep your clothes organized with this telescopic portable clothes rack - it has removable castor wheels so you can move it around easily and quickly, ideal for taking with you on the go! Sturdy and durable, this multifunctional clothes rack will hold a large load of clothes with its strong metal frame and two cross bars at the bottom to prevent it from swaying. Height adjustable and its mobile design makes this clothes rack the perfect storage solution for your clothes. This deluxe multi-layer stainless steel clothes hanger will keep your clothes organized as summer is approaching. It can be used as a clothes dryer - as well as to save money on electricity. This multi-functional clothes rack will hold a large load of clothes with its strong stainless steel metal frame and two cross bars at the bottom to prevent it from swaying. Very happy with my purchase. Thank you so much!!!!!!!! THIS STRONG YELLOW BASEBALL BAT STEERING WHEEL LOCK WILL FIT ALL CARS AND OFFERS EXCELLENT PROTECTION AGAINST THEFT AND BREAK INS. IT IS VERY SIMPLE TO ATTACH AND COMES COMPLETE WITH 2 UNIQUE SECURITY KEYS. KEY DESIGN IS ALMOST IMPOSSIBLE TO DUPLICATE. LOCK TUMBLER ARE VIRTUALLY PICK-PROOF. Various household items for sale and in mint condition. Needs to go URGENTLY for I am in desperate need of the space that it is taken up.